Broadway In Chicago and the RENT 20th Anniversary Tour are thrilled to announce rush tickets will be available for each performance of the Chicago engagement of RENT, the Pulitzer Prize and Tony Award-winning musical, playing at the Oriental Theatre from May 9-14, 2017. These limited seats located in the first two rows of the orchestra section will be available for day-of purchase only. Rush seats must be purchased in-person at the Oriental Theatre box office (24 W Randolph) on a first-come-first-serve basis from the time the box office opens. All $25 tickets are available for cash-only purchase and are limited to two tickets per person. 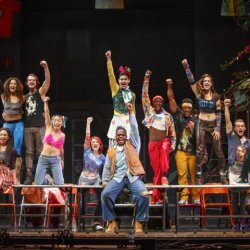 RENT follows an unforgettable year in the lives of seven artists struggling to follow their dreams without selling out. For ticket information and schedule, visit www.rentontour.net or visit www.BroadwayInChicago.com.